How many domains were registered in your county in 2016? Last week we published our dot ie Domain Profile Report which tracks, analyses and reviews the profile of dot ie domain names that were registered in 2016. 34,615 .ie domains were registered during the year so we wanted to share some details with you about where our registrations come from. Where did our registrations come from? Looking at the geographical breakdown of the 34,615 .ie domains registered in 2016, 93% were registered on the island of Ireland. Of that number, 98% (31,665) were registered in the Republic of Ireland (a 2% decrease on 2015); and 2% (560) were registered in Northern Ireland (a 9% increase on 2015). 2,390 .ie domains were registered outside the island of Ireland in 2016, a 4% increase year-on-year. Breaking this down to a provincial level we see that Leinster accounted for 67% of all .ie domains registered in 2016 (21,739), a 4% decrease year-on-year. This was followed by Munster with 19% (6,185), a 4% increase on 2015; Connacht accounted for 8.5% of all new .ie domains (2,739, down 6%); Ulster accounted for 5% (1,562, up 2%). Where does your county rank? In 2016, new Dublin .ie registrations totalled 14,187, or 44% of all new registrations. This was a slight 4% decrease on 2015. 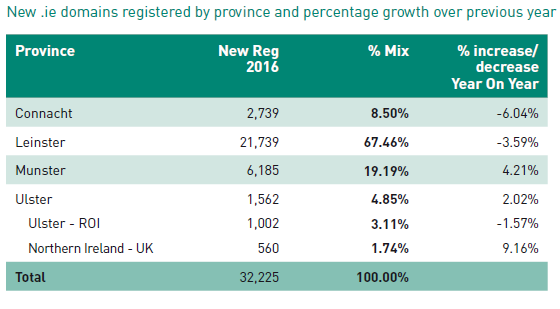 Cork registrations totalled 2,837, or 9%, a 3% increase on 2015; Galway registrations totalled 1,512, or 5%, an increase of just under 1% on 2015. County Fermanagh registered only 31 .ie domains in 2016, the smallest number in Northern Ireland and on the island of Ireland overall. Despite this, the number was up 48% on 2015, the largest increase in any county. County Leitrim registered the smallest number of .ie domains in the Republic of Ireland – 130, or just 0.4% of all .ie domains in 2016. 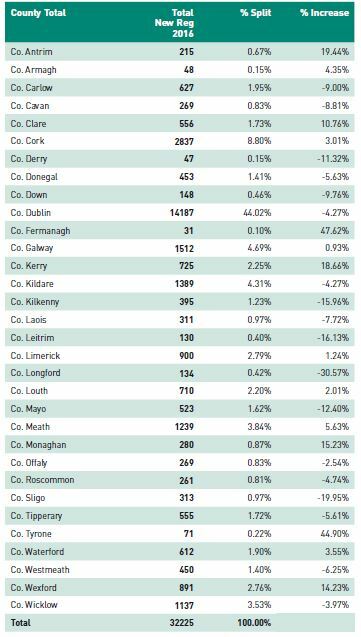 The largest drop in .ie domain registrations occurred in County Longford (down 31%). Dublin has the most .ie domains per 1,000 people (70), while Derry has the fewest (1) overall, and Laois the fewest in the Republic (20). Click here to read the full dot ie Domain Profile Report.